Brooks F. & Ben S.
Dylan A. & Matt M.
There it is. Day 3 presentations. Every group worked really hard so let them know what you think. What did you like? What didn't you like? Matt and Dylan; Awesome job! Love the idea and execution was perfect. 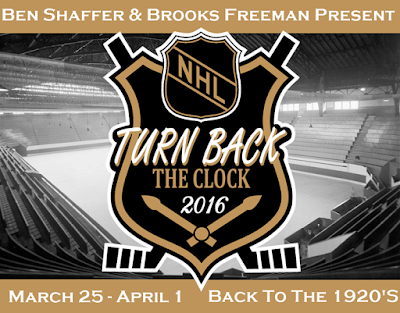 Ben and Brooks; The idea is good but I couldn't read much of the writing due to the Turn Back The Clock logo being in the way. Nice effort and good concepts, though. The big logo on every page was washed out on the file we sent in. I have no idea how that got turned into full color. I love this, the jerseys especially. You guys brought the past and present together to create something new. Awesome job, this would work well for the centennial! You guys might be two of my favorite artists in this page. That new adidas template isn't the best, but yet you made it look amazing! The only thing that bothers me is the logo. The colors, wordmark and the Yankee stadium designs look cool, but the shape of the logo itself is odd. Perhaps stick it inside a shield, like the 2014 logo. Good job on the rest though!